Our Spear Window Awnings are built to resemble Wrought Iron. Unlike other awning companies our Spear designs are made from real Wrought Iron with fully welded finials on the ends and are retractable with a rope and pulley system. The weight of real wrought iron is substantial allowing our awnings to withstand heavy winds. Like all of our awnings, they are available in over 100 Sunbrella Fabric Colors and come with a 10 year warranty on Fabric and Frames. Window shades throughout history have always had a great appeal. Not only do these Traditional Window styles look great on your home they are also appropriate for historical buildings. With a wide range of solid colors and stripes available in Sunbrella Fabrics, you can create a beautiful distinguished style for your home with all the great money saving function’s they can provide for your home. Because of the high quality of our products we offer a 10 year warranty on both fabric and frames. Our exclusive Cafe’ Indoor Awning is available as a kit with frames and sewing instructions or as a complete custom indoor window treatment with your choice of fabric. You can send your own fabric to us or choose fabric from one of our fabric suppliers listed below. The one shown is using a rope trim on the valance of the awning. The valance can have any trim, a wave (scalloped edge) or straight edge. Our PYC Door Awning has been designed to protect you and your home from the weather at your doorways, French doors, and sliding doors. Our stationary (non-retractable) door cover is designed to allow a door to open outward, while giving you full protection from the elements of the weather. Made to last, our PYC Door styles are superbly constructed with 3/4″ OD galvanized frame to withstand wind gusts up to 50 mph. With the strength and integrity of its structure, our PYC Door Awnings are available in widths up to 20′, while its simplistic design allows a simple and immediate installation. Spear Door Awnings the same classic design using real wrought iron pipe with welded finial ends as our Spear Window Awnings. Unlike other awning companies that create the “look” of wrought iron, we have designed our Spear Door design uses Real Wrought Iron Pipe and Finials. Our Spear Door covers are non-retractable with an added wrought iron stanchion bar for support that will with stand wind gust 50 MPH +. Our Spear Window and Door Awnings have hand-forged wrought iron finials that looks great on all styles of homes. Creating shade and adding color is a great addition to your front porch.Not only do they protect your furniture from the elements, they can also add beauty and privacy to your porch. The Porch shades shown on this porch are the same awnings as our Traditional Window Awnings. Not only do they look great over your windows they will also look great on your front porch. Our Retractable Sunflexx Awning is only made with the highest quality materials. Sunflexx is the only one with a certified wind load chart and has a 15 year warranty, the best in the industry! Sunflexx retractable awnings are found at the Marina Hotel owned by Donald Trump, Chicago White Sox Stadium and the White House! Our Shadow Retractable Awning offers customization at a lower price, for a quality awning at a great price with no Chinese components. Our Discount Retractable Awning is the best price for a retractable awning that comes complete with a motor and remote and a non-prorated 5 year warranty. Porch Roller Curtains are designed to provide privacy and shade. With the ease of a rope and pulley system, they can be conveniently raised or lowered to any height desired. Porch Roller Curtains are graceful and simplistic solution of style that will compliment your porch. Choose from a wide variety of colors and styles in your choice of Sunbrella® or AwnTex® Mesh fabrics. Protect and maintain your porch to keep it looking good for years with our Porch Protection Curtains. Our Clear Vinyl Roller Curtains roll down easily and roll up out of the way when they are not needed. You can protect your porch from wind, rain and dirt and still keep your view of the outdoors our Clear Vinyl Roll up Curtains. Our Porch Protection Curtains will keep your porch protected and clean. Canvas Valances around a porch give a sophisticated look to any home. Imagine these graceful exterior features that don’t need replacement for years and are warranted for 10 years. Our custom front porch valances can be made any size and can be arched at the entrance way upon request. Our Patio Umbrellas are custom made with the finest woods and metals, and available in many brilliant Sunbrella® and Outdura colors. Built with only the finest materials, these Umbrellas will last for many years. Our Sunbrella Graphics System can give your business identity and presence and guide customers to your door. Your branding and image can also be front and center on the awnings and umbrellas that shades your door and patio area while customers enjoy your relaxing hospitality. -You can recover your existing PYC frames for a fraction of the cost of a new awning. If you have ordered an awning from us and would like it recovered, but are unsure of the size, please contact-us and we can find the size you need. 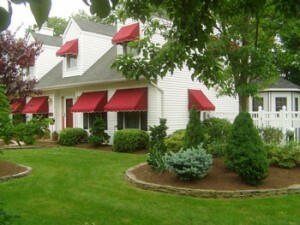 If you have other awnings we can custom make replacement fabric to fit your frames. Email us with your rough dimensions for a price quote, then send your exact measurements or old fabric to us for an exact fit for your awning frames.